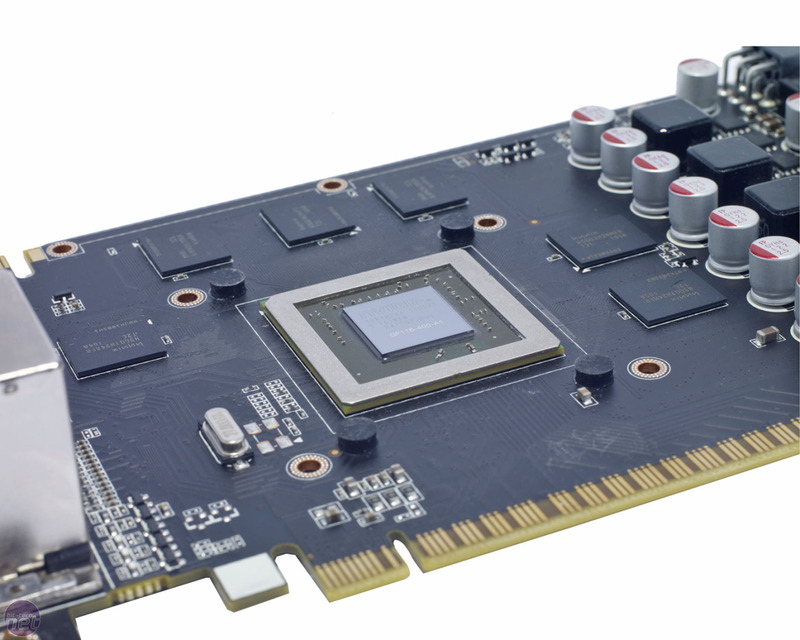 As with the rest of Nvidia’s GeForce 500-series, the GF116 GPU of the GeForce GTX 550 Ti 1GB is based on the Fermi architecture of its predecessor. In this case, that’s the GF106 architecture of the GeForce GTS 450 1GB. This design was essentially the GF104 of the GeForce GTX 460 range cut in half, with just one GPC (Graphics Processing Cluster) comprising four SMs (Streaming Multiprocessors). Each SM used the more efficient configuration of 48 stream processors, rather than the less efficient (bit more densely packed) design of Nvidia’s high-end GPUs. As the GF106 GPU already had a full quotient of 192 stream processors, there are no more to be unlocked in the GF116 iteration. Instead, Nvidia has chosen to upgrade the GPU’s back-end, widening the memory controller from 128 bits wide to 192 bits wide and increasing the ROP count from 16 to 24. The 1GB of GDDR5 memory fitted to the card also runs faster than that of the GTS 450 1GB, with a frequency of 1,026MHz (4,104MHz effective). Comparatively, the memory of the GTS 450 1GB operated at 900MHz (3.6GHz effective). All these improvements have considerably increased the GTX 550 Ti 1GB’s memory bandwidth in comparison to its predecessor, from 57.7GB/sec to 98.5GB/sec. The extra ROPs and memory bandwidth should mean that the GTX 550 Ti 1GB can handle post-processing effects such as AA more easily than the GTX 450 1GB. In addition to the re-jigged and more capable back-end, Nvidia has also used the same low-leakage transistors as the rest of the GeForce 500-series for the less performance-critical areas of the GTX 550 Ti 1GB. This has enabled Nvidia to ramp up the GPU's clock speeds. The GTX 550 Ti 1GB’s GPU core runs at 900MHz, 15 per cent faster than the GTS 450 1GB, meaning that those 192 stream processors operate at 1.8GHz. As the GTX 550 Ti 1GB is effectively half a GTX 560Ti 1GB, we’re also hopeful that it will have inherited its sibling’s superb overclocking potential. Despite the extra frequency and enhanced back-end, the GTX 550 Ti 1GB requires just a single 6-pin PCI-E power cable, and has suitably diminutive power requirements. Nvidia recommends a 400W PSU, but with a maximum stated TDP of 116W, almost any PC sold in the last few years should handle a GTX 550 Ti 1GB upgrade.